We’ve proven that following people is good for business. MirrorWave impacts retention, share, productivity and word of mouth. Cumulatively these four business outcomes can have a significant effect on business efficiency and profitability. Listening has a reputation for being soft and for good reason! The blow torch needs to get applied hard enough to understand the business outcomes. This is a perfectly reasonable requirement and entirely doable. 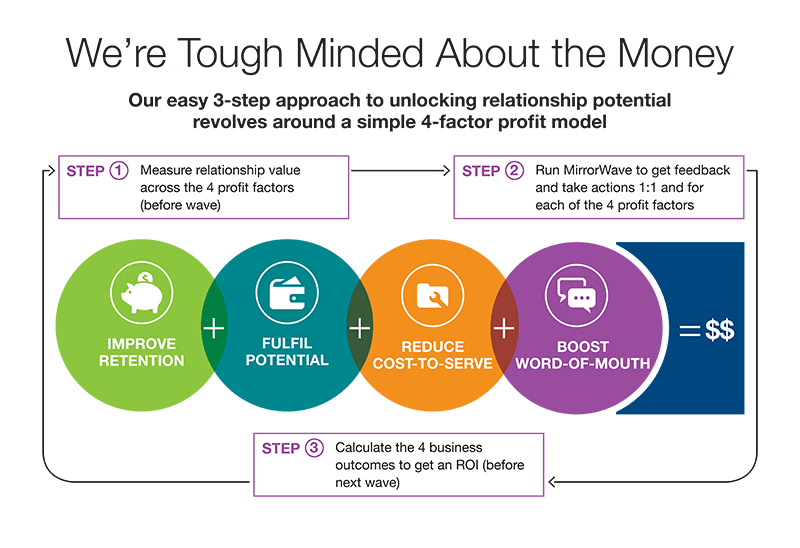 calculates the 4 business outcomes defined by the 4-ways model. A Strategic Account MirrorWave client achieved an ROI in their first wave of 24x by saving an unexpectedly vulnerable key client. A Customer MirrorWave client found in their first pulse that 7 out of their top 10 clients in one region were under more threat than the account team had realised. Concerted action and demonstrable listening saved 6 of them. An Employee MirrorWave program maintained retention at normal levels despite their very unsettling demerger. An Employee MirrorWave client running a conversation of shared purpose with employees immediately turned around a history of low or no growth merely by focussing employee share of attention on internal enablers and barriers to growth. A senior manager at a Strategic Account MirrorWave client visited a key contact who felt they had fallen between the cracks because of churn in the team. One of the biggest sales of the year, not registered as an opportunity, was secured, instead of it going to a competitor. A Customer MirrorWave client workshopped ideas emanated from their positive comments, enabling the company to maintain its high ratings from customers, but to also grow the number of its revenue streams from 2 to 12. A Customer MirrorWave client tripled the number of ‘delighted’ clients and halved the number of dissatisfied ones over 3 years reducing the stress and strain on the customer service team and keeping head count level by nipping in the bud potentially time consuming customer issues. A Partnership MirrorWave client was surprised by the attitudes of his own employees towards their desired partnering values and used this as a catalyst seizing on and addressing recurring time consuming problems that had internal root causes. An Implementation MirrorWave client used feedback elicited over the course of a struggling talent management program to transform into a sought after and highly recommended signature for the company. A Customer MirrorWave client turned an active detractor and former key client into a vigorous and supportive advocate by accepting that they had stopped listening because the client kept complaining about the same ongoing problem which had been given insufficient leadership attention to resolve. What is the MirrorWave process?